Former Missouri Secretary of State Jason Kander is reportedly laying the groundwork to succeed Sly James as Kansas City’s mayor. Several sources have told the Kansas City Star the Democrat could officially launch his candidacy as early as next week. 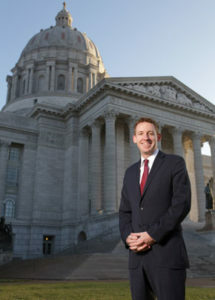 Kander is currently the head of Let America Vote – a national voting rights organization. If he enters the mayor’s race, the move would ease speculation about Kander making a run for president in 2020. He’s been traveling the country since 2017 making several stops in key presidential states like Iowa and New Hampshire. According to the Star, Kander would join a crowded field of eight other candidates who have already announced a run for mayor. Kander, an Army veteran, served two terms in the Missouri House of Representatives and then as secretary of state. In 2016, he lost the U.S. Senate race by a tight margin to Republican incumbent Roy Blunt. The Star says Kander has not organized an official campaign committee with the Missouri Ethics Commission.